I often find the New Critical dogma “there is nothing outside the text” most fruitful when applied to poetry; but in the case of Jo Shapcott’s newest collection it feels somewhat callous, if not inhuman, of me to ignore context, written (and marketed (either rightly or wrongly)) as it was as a reaction to her diagnosis of and recovery from cancer. I couldn’t help but let my knowledge of this colour my reading; as such, what follows is a review with a caveat: that of being a great big intentional fallacy. I’m not sorry. ‘Of Mutability’ has a name that harks back to a much older grammatology of title; in fact the construct preposition-noun has seen somewhat of a trendy resurgence in recent years (On Beauty, Of Nature, On Writing, Of Love etc. ), but don’t let this put you off, there’s no bandwagoning here: crucially Shapcott’s title it beset with irony, as the fear of death, pain, loneliness and the potential permanence of the same are narrative preoccupations that haunt these poems just as much as the focus on change that’s suggested by the title. So much for this book’s name being the obvious and helpful statement of intent I’d expected. ‘Of Mutability’ opens with a series of what could liberally be described as sonnets (fourteen lines each: an octet followed by a sextet; but no stringent adherence to a prescribed metre or rhyme scheme – perhaps ‘free verse sonnets’ would be a better, if somewhat oxymoronic, description). The first of these deals more explicitly with illness (without actually name-checking cancer) than any other poem in the book, “your blood tests / turn the doctor’s expression grave” and begins with a list-like sequence of unpleasant adjectives – all spondees, all separated by commas “itching”, “feeling”, “jagged”, “razor”. This heavily punctuated, heavily stressed opening is so rhythmically severe that it forces the reader’s impetus into a slow, deliberate, unbroken syllable-by-syllable stomp; each harsh beat, marked by cæsura, functions as pounding onomatopoeia in mimicry of the relentlessly unpleasant sensations being experienced by the narrator. The second stanza, however, acts as volta to this down-beat opening by focusing on hope, learning and life, and is characterised by light-centric imagery, “sky”, “chandeliers”, “comets” etc. Compounding this tonal shift is a change to a much lighter, quicker rhythmic cadence: list-like constructions remain, but there are fewer commas to slow the pace and a progressive increase in the syllable-per-word ratio that forces the reader to speed and trip-up over the lines, a rhythm that supplements the lighter and more hopeful direction the poem has taken. Sure it’s free verse, but that’s not to say rhythm isn’t important. This disconnect (or, rather, this convergence) of the dour with the light-hearted actually functions as microcosm for the entire collection. The dominant themes throughout are death and change, but ‘Of Mutability’ is not a relentless onslaught of misery, tempered as it is by frequent comic, pastoral and historical interests. Admittedly this interjection of the comic does run the risk of bathetically undermining the seriousness of the book’s titular theme, but Shapcott is mostly successful in merging pathos with humour in a way which adds depth, rather than detracts from it – and again this augments the sense of irony that we’ve already encountered. The poem ‘Tea Death’, for example, is a six-stanza description piece of man who’s collapsed into his cup of tea, and died. This morbidly comic image begins with a charming and funny confluence of blood and tea “lungs topped up / with Earl Gray, snorting // tea leaves which would gather / in the distant networks / of his blood” but is immediately undercut by an allusion to a sad life and alcoholism. The disparity in the title between the domesticity suggested by ‘Tea’ and the profound unknowability of ‘Death’ is an antagonism at once comically absurd yet relatable and alarming; the enforced proximity of the prosaic ‘tea’ with the abstract ‘death’ sums up the general tone of the collection: ‘Of Mutability’ makes-light of what’s serious while debasing the commonplace – which is probably a better blurb for the back cover than any of the phoned-in comments that were actually used, if I do say so myself. Which I do. So an important role is played by the paratextual (that which is external to the main text: titles, epigraphs etc.). It is often difficult for the reader to grasp simply from the text alone the full import of these poems. The title of ‘My Oak’, for example, actually accounts for the poem’s first two words, and runs immediately into its un-capitalised opening line. The title of ‘Gherkin Music’ offers the only hint of what’s being described (the eponymous London skyscraper); and the title of prose poem ‘Scorpion’ is the exclusive place in which the metaphorically loaded creature being killed by our narrator is actually named. Returning to the theme of biography then; a supplementary feature of this collection that helps holistically bind the poems together is the repeated use of the word ‘cell’, which functions as the book’s defining refrain and appears at least once in (almost) every poem. To call-back my intentional fallacy: I couldn’t help but correlate this word to Shapcott’s illness, and to me ‘cell’ became synonymous with cancer, sickness, pain. It’s unnerving that such a short word can alter the course of an otherwise fundamentally comic or pastoral or descriptive (or whatever) poem with context-imposed connotations of grief and fear and abnormality. On a more twee level, the word ‘cell’ can also be used as label for each of these short, self-contained poems that, when considered synchronically, comprise the ‘body’, if you will, of this collection. There’s the occasional gaffe, for example ‘Composition’, which features the cringe-inducingly clichéd line “I was drowning in possibility” and is somewhat of a conceptual miss-fire, as the narrator composes a beautiful verse while, ostensibly, being distracted by her surroundings because, dammit, she just can’t help herself – she’s such an innate poet. But such errs are rare. Fundamentally this is a very modern book of poetry, frequently abstract and tricky to pin-down, many poems squirm and slip and defy meaning. The aforementioned pseudo-sonnets and some occasional para and internal rhyming are the only nods to neoclassical form, and while some pieces have a kind of regimented stanza length, this is about as structured as they get. 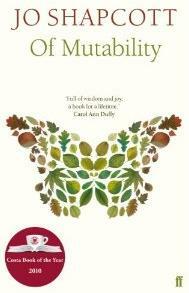 But even if modern poetry isn’t quite your thang, I’d recommend you give ‘Of Mutability’ a try: it’s an unusually lyrical collection, considering its ilk; and its thematic collision of beauty and pain offers a successful heuristic to the problems of espousing a verve for life while simultaneously suffering an horrific illness. I suppose it’s up to the caprice of the individual reader whether or not you allow knowledge of Shapcott’s cancer to colour your reading, but for what it’s worth, it definitely helped me ground some of the more abstract pieces within a graspable context and, if anything, it added a poignancy and thematic cohesion that might otherwise have been lacking. This entry was posted in Reviews and tagged Costa Book of the Year 2010, Jo Shapcott, Of Mutability. Bookmark the permalink. Tomcat, would you say this would be a good collection for someone who is a bit of a novice with poetry and only just learning to love it again? It sounds an interesting collection indeed, but one that maybe might be a little ‘too much’ for a novice, or am I selling myself short? Its the slippery bit that concerns me. Ummm.. I’d say yes and no: it’s a book of very short poems (only a couple extend beyond a single page), which is an easy way-in; but while about half of them are very immediate and interesting, the other half may leave you scratching your head and wondering what the hell she’s getting it, which necessitates re-reading ( and re-reading and re-reading). Having said that, your Wendy Cope review seemed very confident and knowledgeable to me, so I’m sure you’ll be fine reading Jo Shapcott! When I got into poetry, I bought a massive anthology (The Norton Anthology of Poetry) – it’s great to dip in and out of, and contains several poems by any major poet you care to name. I think this approach is best for beginners because you can decide what type of writing/poetry you’re into before spending money on poetry books by individual writers. BUT: the absolute *must* for all poetry readers is an incredible little book called ‘The Poetry Handbook’ by John Lennard. It explains, chapter by chapter, everything you need to know to understand poetry, from rhyme schemes, rhythm, layout, imagery, punctuation, metre etc. – it’s utterly, utterly brilliant, – very readable and relentlessly interesting: an invaluable source of information. I read it while I was perusing the Norton Anthology of Poetry, and, in combination, I learnt so much so quickly.